Isabella Cruise is starting married life in Croydon, England after tying the knot last month without her famous parents in attendance. 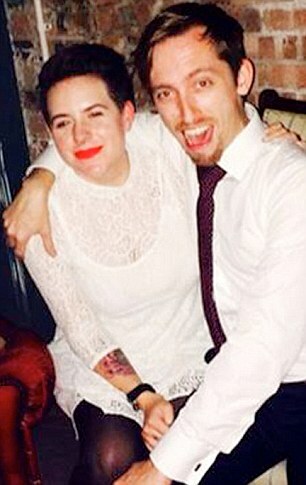 Isabella, 22, a makeup artist, married Max Parker, IT consultant, on September 18 in a very intimate ceremony in London. Father Tom Cruise did not join the couple but reportedly picked up the tab. The ceremony was held in a private function room of the very posh Dorchester Hotel, in accordance with the Scientology traditions that Isabelle shares with her father. Isabelle’s mother Nicole Kidman was also not present at the wedding, but according to sources helped plan some of the elements and is said to be happy for her daughter. Brother Connor was also a no-show, apparently to keep the nuptials as low-key as possible. The couple are moving from their current London address to a new one on the outskirts of the city, in an area more familiar to Max’s family. 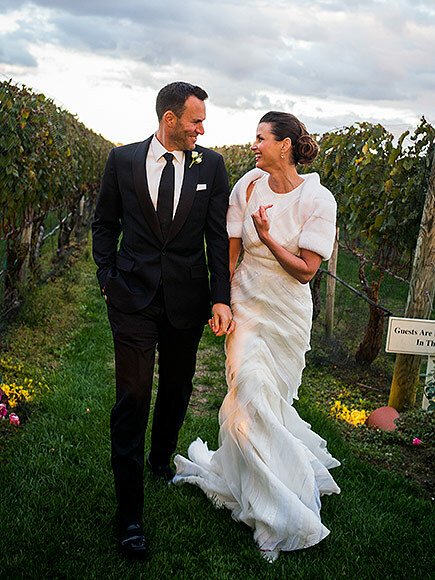 Bridget Moynahan, who stars in television’s Blue Bloods (and who is also known as Tom Brady’s ex) tied the knot last weekend with boyfriend Andrew Frankel. The couple also kept the union on the down-low, with People.com being the first to cover the story. The beautiful evening wedding took place outdoors on October 17 in the swanky locale of the Hamptons, New York, with select family and friends in attendance. The couple requested that guests donate to one of their favorite charities, the Hole in Wall Gang Club to help youth with cancer and serious blood disorders in lieu of gifts. For more photos visit Moynahan’s Instagram account. Justin Theroux appeared on an episode of Ellen on October 14, and shared a few more deets about his wedding day and his wife, Jennifer Aniston. Ellen also brought out a hilarious mannequin of Jennifer (see photo above). Ellen, who was a guest at the wedding, marvelled at how long they were able to keep a secret and Justin verified that they were able to do so by sending out birthday party invitations. He revealed that they originally planned to share the secret with certain key guests, but then decided it was a bad idea. And last but not least, Jenni “JWoww” Farley, 29, married boyfriend Roger Mathews, 40, on Sunday October 18, in front of family and friends after five years of dating. The former star of Jersey Shore and now-husband Mathews have one daughter together, Meilani, who made a sweet flower girl. During the wedding party, the family joyously announced that JWoww is expecting another child, with a huge poster to show the guests. The wedding palette consisted of various hues of purple, with lush purple and flowers and other accents to tie together the royal look. If you love Jenni’s flowers, try white hydrangeas, lavender roses, and red roses. All are available in bulk for low prices at BunchesDirect. The candy bar completed the “purple” theme. The couple enjoyed a purple-themed rehearsal dinner the night before complete with many sweet treats for their guests. Click to view even more purple wedding flowers and be inspired by the “WOWW” look from Jenni’s wedding. We wish all the celebrity couples the best of health and happiness! One of the most “delicious” flower and fashion trends of late is the move back to more berry and jewel tones for your color palette. The 2015 color of the year, after all, was a rich burgundy hue called Marsala and we are seeing variations of it everywhere from clothing to housewares. It’s easy to see why—these rich tones lend a lush and romantic vibe to any event and are especially suitable for weddings. Pair them with cool blues, pale greens, dramatic blacks or grays, and they will suit any event theme from traditional garden to modern with a Parisian twist. 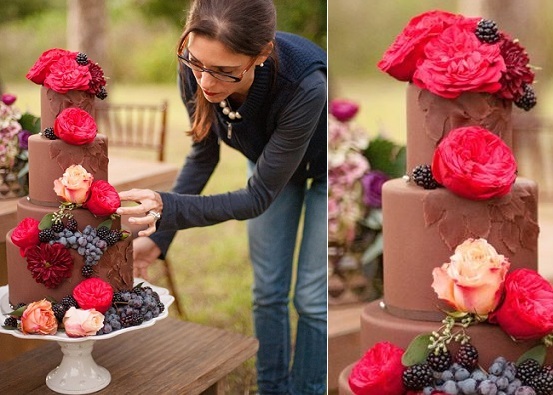 Berry tones will work their magic in any season or venue. The top photo was taken from a midnight garden wedding designed by Julie Savage of Strawberry Milk Events. Deep tones of red garden roses mixed with exotic purple anemones create this lush flowerscape. Both available at BunchesDirect. Bouquet below: Deep and Divine Calla Lily. Flowers in rich berry tones are perfect for any season, but add an extra element of warmth and drama to fall and winter weddings. The rich color of the flowers provides excellent contrast with a white wedding gown and traditional grey or black suits or tuxedos. Berry tones pair especially well with gold or silver metallic accents. 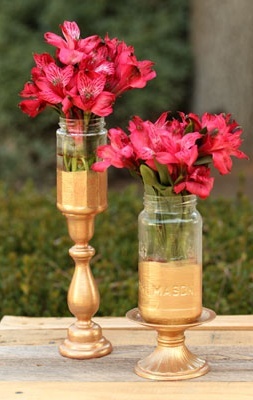 Below, pink alstroemeria blends beautifully with the gold sand in these simple mason jars. Laura Yang and the Pastry Studio used beautiful berry-toned flowers including burgundy ranunculus to decorate their delicious chocolate cake, making it look a scrumptious as it tasted. To create this look at your own wedding or event, choose a variety of lush flowers in berry or tones of hot pink, pink, red and burgundy. The combination of textures and colors will add a very dramatic element to your decor. Show below, red roses, hot pink spray roses, burgundy ranunculus, and purple alstroemeria. All of these and more berry toned flowers are available in bulk for low prices at BunchesDirect. For your bridal bouquets, Enchanted Kiss, Red Berry, or Crimson Dream or Red Romance are all perfect choices that will provide the perfect complement to your berry and jewel tone wedding palette. Happy planning! We’ve gathered some great inspiration and tips to help you make your flower decorations a snap, for a variety of popular styles. Let the container set the tone and choose flowers accordingly. Choose large blooms such as garden roses, hydrangeas and peonies, which look stunning when simply arranged in a vintage serving vessel, such as a soup tureen. You could also use tea pots for the centerpieces, with tea cups for smaller arrangements on smaller table tops or at each guest place. Don’t be afraid to get creative with your choice of container: jelly molds, cake tins and even small ice buckets all make wonderful containers. If you need something casual, and extremely simple, simply gather up some oranges, apples, lemons or other fruit. Determine how the fruit will naturally balance, and insert holes. Insert fun flowers that will suit the casual vibe, like chysanthemum or gerbera daisies. Use straws to help support the stems. Arrange on a lovely plate or cake stand and presto—instant wow factor. Another fun centerpiece that incorporates fruit is this cute and “zesty” arrangement. Choose yellow alstroemeria (also known as Peruvian lilies) and arrange in a clear container with an assortment of small fruits such as lemons, key limes, or kumquats. The fruit pairs perfectly with the bright blooms, and you can have a gorgeous centerpieces in minutes! For another casual take on centerpieces, choose one long, narrow box or packing crate. Purchase some bulk gerbera daisies and add some wheatgrass or other vibrant greens and create one long centerpiece down the middle of the table. Use extra gerberas to set at each place setting, Gerberas are available in bulk at BunchesDirect by the stem, or by the box, in a variety of cheery colors. Perfect for a birthday party, a bridal or baby shower! Beautiful red carnations are very budget-friendly, but create amazing impact when placed in a rustic wooden salad bowl. It doesn’t get any easier than this, but what a gorgeous way to spice up your dinner party display. For more 5 minute centerpiece ideas, visit realsimple.com. Good luck with the party planning! Be sure to share your own great tips and tricks for fast and easy centerpieces.